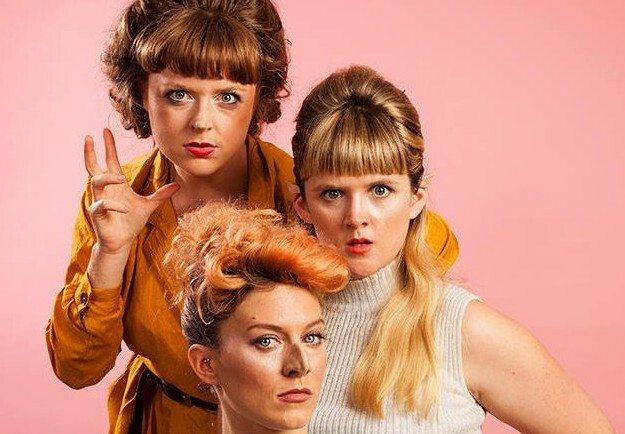 The Travelling sisters ( Lucy Fox, Laura Trenerry and Ell Sachs) are one of the best new comedy sketch trios I’ve seen in a while. Considering this was the 2nd performance of their new show, Noo Sho was a pretty entertaining hour of sketch comedy. Noo Sho is not the kind of show trying to make you think or learn, it’s just pure, adorable silliness. The skits themselves don’t really have any connecting theme. They are mostly short and only a song about the High School Formal runs a bit too long. It could do with some backing music to pump it up too. Some skits are plain perplexing and some don’t go anywhere interesting but the performers are always engaging & fun to spend time with. I’m always impressed by comedic performers who are willing to forget their ego on stage to get the laughs. The best sketch was about two ladies in a dressing room after yoga with the universal humour of someone who keeps up a conversation when you just wish they would leave but are too polite to say. It plays out beautifully with a bit of weirdness towards the end that almost spoils it. All the more interesting because it is about getting changed and that is a big part of this show. The costume changes have to be addressed because the costumes and wigs are elaborate and impressive and most of the changes happen on the lit stage. They have written some lovely music for these interludes and the little bits of audience interaction are delightful (not too overdone) but they sometimes feel longer than some of the skits. They are pretty good at choreography, so a bit more stylisation – even if it was just for 1 or 2 of the changes would add some interest for the audience. If not I’m sure these bits will tighten up as the show goes on. It is not surprising to learn that they are all Gaulier girls. It shows in their physical prowess and strong stage presence. This helps them get laughs from the flimsiest of pretexts. There are also a lot of great ideas, but some need a bit of work to bring them to a more satisfying level. They asked for feedback at the end and my main advice would be to open with the toadstools & do a bit more with them. Otherwise an enjoyable hour with heaps of potential.